The Frankincense we sell here at Inglenook farm has all been distilled, filtered and bottled here ready for sale on site from resin sourced in Somalia. The Essential Oil of Frankincense is produced by steam distilling Frankincense Resin. This Particular resin is obtained by making deep incisions into the trunk of a Frankincense Tree. From these deep incisions the resin bleeds out and dries in waxy, pale yellow tears which the fall to the ground and are collected for distillation. 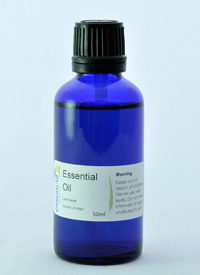 This Essential Oil is pale yellow in colour and has a thin consistency. The aroma of this oil can be described as woody, spicy, warm, balsamic, slightly lemony and fruity. Frankincense Essential Oil is known to blend well with earthy Scents such as Sandalwood, Benzoin and Pine. Lemon, lime and orange also make good accompaniments to Frankincense as well as other citrus based oils like mandarin. Floral scents can also blend pleasantly with Frankincense a couple of examples are Rose, Jasmine Bergamot and Lavender. As well as using frankincense Essential Oil you can also use pure Frankincense resin in an oil burner to produce that calming aroma in order to help you relax, however the aroma of the Essential Oil is said to be much sweeter and fresher than that produced by burning the pure resin which can also be used in various settings. Frankincense has been found in the remains of ancient Egyptian and Anglo-Saxon civilizations, it was often used by them for many of their religious traditions and rites. Frankincense is closely related to the Christian faith and is often uses in churches, being one of the gifts believed to be given to the baby Jesus by the Magi. Frankincense has many different properties such as Vulnerary, Emenagogue, Astringent, Antiseptic and Disinfectant that make it very useful for aiding and treating various health disorders and injuries, here are a few of the most beneficial applications of Frankincense Essential Oil. Frankincense is said to be an effective antiseptic and is very useful in inhibiting the growth of disease-causing micro-organisms, so it can be used in cleaning and in the prevention of disease. Frankincense is a powerful astringent which means that it can cause the contraction of skin cells and other body tissues making it very useful for preventing bleeding of cuts and abrasions and can be used to tone skin and prevent hair and tooth loss. Frankincense oil helps to eliminate gas and prevent it from building up in the body. This can also help to relieve other problems such as abdominal pain, stomachache or indigestion. The digestive qualities also help to keep the stomach and digestive system working properly by promoting the production of digestive fluids like bile and stomach acid. This property means that Frankincense Essential Oil will promote the growth of scar tissue which will help wounds and abrasions to heal faster. A diuretic is any substance that promotes the production of urine; Frankincense possesses this quality and so can help to remove toxins like sodium form the body via urination. Emmenagogues will stimulate blood flow to the pelvic area and uterus. This will stimulate menstruation when it is absent for reasons other than pregnancy such as hormone imbalance, this can also help to prevent pain caused via menstruation. As an expectorant frankincense will help to promotes the secretion of sputum by the airway passages, this can be very helpful when treating coughs or respiratory infection. Sedatives are substances that are known for promoting calm or inducing sleep, frankincense is brilliant for this and is often used during meditation or yoga. A substance which is a tonic will tone up the skin, muscles and internal organs and will also give a general feeling of wellbeing. Frankincense will help to protect wounds, cuts and bruises from becoming infected and helps to promote healing therefore it serves as a vulnerary substance. The extraction of the essential part or most important aspects of something. This means that no chemicals are used when we distil our oil so the outcome is all natural here is a simple explanation of where your oil comes from. Water is heated to provide steam which then passes through another tank filled with frankincense Resin. This causes some of the components of the resin to vaporise the steam passes through a condenser where it is cooled down to produce liquid form the steam. Because the oil and the hydrosol have different density the oil produced will float to the top of the collected liquid and the water or hydrosol can be taken away and used separately from the Essential Oil. 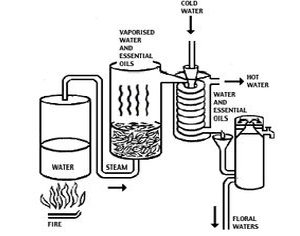 When Steam Distillation is carried out to produce Essential Oil the condensed water is known as a Hydrosol. Facial Spray: Close your eyes and lightly mist your face. Body Spray: Lightly mist your body to feel cooled and refreshed. Depending on the aromatic intensity of the hydrosol used, your body will be left lightly fragranced. Deodorant: Hydrosols with antibacterial properties like lavender can be especially helpful in minimizing body odor. Foot Spray: Mist the tops and bottoms of feet to help control foot odor and to refresh your feet. Hydrosols with antibacterial properties can be especially helpful in minimizing foot odor. Air Freshening Spray: Use hydrosols to freshen a room and to benefit from the emotional and therapeutic properties that are Inherent with the chosen hydrosol. Linen Spray: Use hydrosols to freshen and fragrance sheets, towels and other linens. Car Freshening Spray: Mist the Interior of your car, avoiding polished, painted and fragile surfaces. Garment Freshening Spray: Lightly spray clothes (avoid sensitive and delicate fabrics to impart a gentle aroma and to help eliminate unpleasant musty, smoky or other odors. Calming Spray: Mist your room, body and face using hydrosols that are reported to help reduce stress and anxiety. Wound cleanser: Lavender hydrosols can be used to help kill germs and promote the healing of minor wounds, cuts and abrasions. "Monster" Repellent: Calming hydrosols can be used to help calm and soothe babies and children and of course repel monsters. Men's Aftershave: Hydrosols can be adapted for use as a men's aftershave. l Java development from Incode Group on time.